Birthing baby plants. Small blocks with seeds just cracking open. Are you wondering about how to start seeds? This tutorial will walk you through the steps and if you want more instruction check out my Seed Starting Made Easy online course. 1. It’s all in the soil. Use our special soil blocking mix or follow the recipe to make your own. 2. Add water according to instructions. Mix will be very wet. 3. Use any flat container with no drainage wholes and shallow sides like meat trays. 4. Press blocker into the soil 2 to 3 times to fill the chamber. 5. A gentle squeeze and a little jiggle will eject the blocks. 6. Use a tooth pick, a metal seed pan and saliva to easily place one seed on each block. If the seed needs to be covered, just press it into the block with the tooth pick. 7. 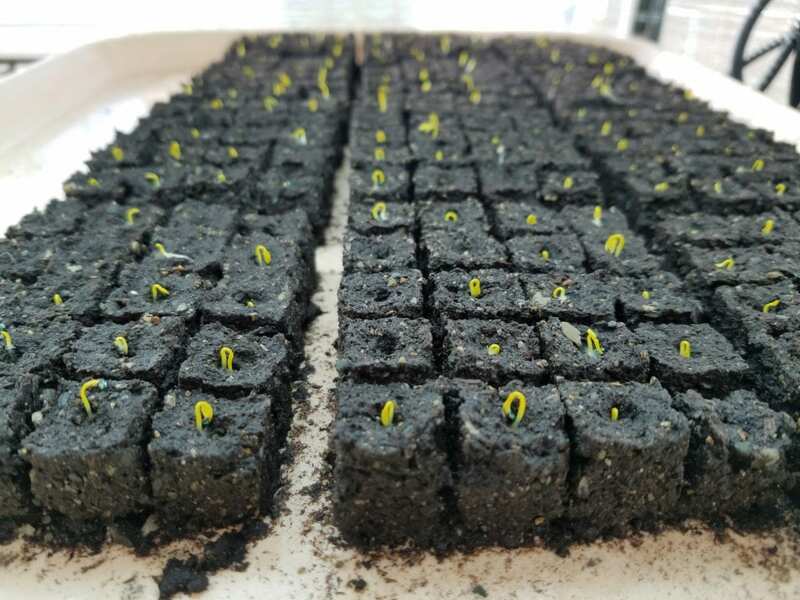 Place trays on a seedling heat mat. 8. Water blocks daily with a gentle stream of water in the side of the tray. Let them sit in water for a few minutes and then pour any leftover water off. 9. Move from heat to grow light when half of the blocks crack through the soil. Set timer to 16 hours a day. Adjust the light a few inches above the seedlings and move it as they grow. 10. Plant the soil blocks in the garden when they are 3-5″ tall. Be sure to harden them off first or use a floating row cover to protect them until they become accustom to the outdoor environment, 7-10 days. Can soil blocks be placed in greenhouse rather than inside under lights? My soil blocks came out perfectly but after watering I noticed a white like cast on top of blocks. Is this Normal or should I use distilled water? One more question….about 25% of seeds sprouted is it too soon to put them under grow light? Mold can grow if the blocks are kept moist all the time. They should go through the cycle of watering and being moist and drying out during the next 24 hours. If they are not drying out,warmer air temps help. Move from heat to light when 50% have sprouted. I’m loving this method and trying it for the first time. Any tips on snapdragons? They seem to grow so slowly!